A number of years ago, a good friend of mine who was an herbalist brought over a new formulation -- or rather his version of a traditional herbal-based "deep tissue oil." His timing was perfect because I had been working on the development of an all-natural transdermal system capable of quickly "transporting" herbal extracts through the skin and into the underlying tissue and joints. As we will discuss in this report, virtually every topical pain relief product on the market has "some" transdermal capabilities, but what I had been working on was levels of magnitude beyond those. It seemed as if we had the makings of a whole new order of topical pain relief. Now comes the part of the story that drives pharmaceutical companies and medical doctors nuts. Whenever I tell them how I actually developed the formula (pretty much all formulas, for that matter), they get angry. Their instincts say that I should have pulled out medical texts and designed the formula from a book, using all the ingredients that the texts say relieve pain and in the amounts recommended in those texts. Unfortunately, developing natural formulas in the real world doesn't work like that. Follow that approach and you end up with products like the intestinal health formulas that use both probiotics and goldenseal as ingredients--since, according to the texts, both are supposed to be beneficial for intestinal health. The problem is that the texts don't make it clear that those ingredients are mutually exclusive. Goldenseal provides its benefits by killing bacteria--including the probiotics that are in the formula. Another problem, of course, is that some of the most effective ingredients, although they have been in use for centuries, have very little study behind them--so you won't find them in the text books. In the end, and this is the part that upsets medical people, designing natural formulas involves at least as much art as science. In any case, I selected the ingredients I wanted for the topical pain relief formula and the amounts to use based, not on texts, but on the over 30 years of experience I had back then actually working with ingredients in the real world. Now, at that time, I was speaking regularly around the country, so I brought samples of the formula with me and, after the talks, mentioned that I was formulating a topical pain formula and asked if anyone wanted to try it on the spot. Based on the instant feedback I received, I tweaked the formula--both modifying the ingredients and their ratios in the formula--bringing the new version to the next talk. Over the course of about nine months, I ended up going through several dozen iterations of the formula, until I had finally homed in on the most effective version. For example, and I'll talk more about this later, I tested versions without emu oil, then with, then without, and finally determined that it needed to be in the formula for maximum efficacy. There's simply no way to design the optimum natural formula without extensive trial and error testing. I actually launched the final version of the formula at a lecture I gave to about 500 people. After explaining the formula and what it did, I asked that bottles of the formula be passed out through the audience so that everyone who wanted to try it on the spot could. This went on as I continued to talk about the formula for another 10 minutes. Finally, I asked, "How many of you tried the formula?" About 300 said they had. "How many of you experienced a result that you would like to talk about?" Astonishingly, about 240 raised their hands. We then passed the microphone around, and for the next hour it was like being at a revival meeting. People gave testimonials that chronic pain that they had in a finger for years was now gone in minutes. Or that they hadn't been able to lift their arms above their shoulders for 20 years, but now in a matter of minutes they could…and then they started dancing and waved their arms above their heads. It was beyond anything that I had imagined when I first started to design the formula all those months ago. To understand how such a formula works, it helps to have some understanding of how the body interprets and handles pain. The pain impulse begins at the point of injury -- either external, such as a cut, a burn, or a scrape; or internal, such as a knuckle swollen with arthritis. Once the impulse starts, it triggers a number of bio-chemicals to be released at the site of the injury. Some of these bio-chemicals are histamine, bradykinin, prostaglandin, and Substance P. Each of these has one or more effects on the body. And many of these bio-chemicals are inflammatory -- that is, they cause the injury site to swell up. Inflammation is actually a defense mechanism for the body. Inflammation serves to bathe the injury in healing fluids and acts as a cushion to protect against further injury. However, if the inflammation is prolonged or out of control, it can cause destruction. This is what occurs in arthritis, where the inflammation actually destroys the joints. Also, inflammation can serve to compound problems by actually causing pain itself. This explains how an injury causes the body to release a number of bio-chemicals that can cause inflammation. Another action of these bio-chemicals, though, is to stimulate the nerve fibers of pain, the C fibers. (The body actually has three types of nerve fibers: A fibers, B fibers and C fibers. The main fibers which transmit the pain impulse are the C fibers.) Histamine, bradykinin, prostaglandins, and the other bio-chemicals are actually the stimuli that cause the pain impulse to begin. In other words, the release of Substance P can result in a snowball effect on pain and inflammation and is a critical determiner of "pain." Substance P also plays a role in the pain impulse at the second key site for pain, the spinal cord. The spinal cord is connected directly to the brain -- so, pain first must pass through the spinal cord before it reaches the brain. The C fibers carry the painful impulse to the spinal cord. In the spinal cord the C fibers end, and a nerve called a projection neuron and an ascending tract begins. This ascending tract carries the pain impulse on to the brain -- the third key site for pain, and the final stop. The brain is where pain actually registers. If the impulse doesn't reach the brain, there is no pain. There is no physical connection between the C fiber and the projection neuron. The communication between the C fiber and the projection neuron is accomplished by the release of a chemical called a neurotransmitter (NT). The NT is released by the C fiber and travels across the space between the C fiber and the ascending tract and transmits the painful impulse to the ascending tract. If the NT is not present or is reduced, the transmission of the painful impulse is slowed or stopped. The main NT in the spinal cord for this transmission is Substance P.
Decreasing the levels of the "pain" bio-chemicals. Or by blocking the nerves of pain, the C fibers. With that in mind, it would make sense to use a painkiller that can do both of these. Aspirin and NSAIDS (non-steroidal anti-inflammatory drugs), such as ibuprofen and Motrin decrease the prostaglandins. This can result in decreased pain and inflammation, especially if the prostaglandins are the main causes. However, aspirin and NSAIDS do not directly affect the other pain chemicals and do not affect the pain nerve, the C fiber. But we also know we can interrupt the pain impulse away from the injury site, at the spinal cord. If our pain killer could decrease the release of (or deplete the C fiber of) Substance P, the pain impulse would be blocked at the spinal cord and never reach the brain. Aspirin and NSAIDS have no known effect at this site. Narcotics and tricyclic antidepressants, such as amitriptyline or Elavil, on the other hand, actually can block the release of Substance P and stop transmission at the spinal cord level, but once again have no value in decreasing the levels of the bio-chemicals of pain. There are solutions that do it all. Decrease the levels of the "pain" bio-chemicals. Block the release of Substance P, thus slowing down the transmission of the pain impulse along the nerves of pain, the C fibers. And slow down transmission of pain along the spinal cord. At the site of the injury, there are essential oils that work as natural nerve blocks by confusing the pain nerve and causing it to release an overabundance of Substance P, which ultimately totally depletes the nerve of Substance P. This directly decreases the snowball effect of Substance P on pain and inflammation (and indirectly decreases histamine, bradykinin, and prostaglandin). There are natural substances that, after an initial brief excitation (felt as either warmth or cold), work to directly block the impulse conduction in the C fiber. That is, they directly block the pain producing nerve. This is not dependent on Substance P, but is the result of what is called an "amnestic" effect -- the overloading of the pain nerve through continual stimulation so that pain impulses cannot travel on it. So unlike most other painkillers, these substances affect both the chemicals of pain and the nerves of pain. To explain this in more technical terms, there are a number of different Transient Receptor Potential (TRP) ion channels that are located in the membranes of most cells--especially nerve cells. In fact, there are about 28 TRP channels that share some structural similarity with each other that have been shown to be sensitive to different ranges of temperature and probably are responsible for our range of temperature sensation. Many of these channels mediate a variety of sensations like the sensations of pain, hotness, warmth or coldness, different kinds of tastes, pressure, and vision.1 In the body, some TRP channels are thought to behave like microscopic thermometers and are used in animals to sense hot or cold. Some TRP channels such as TRPV1 are activated by molecules found in spices like garlic, cayenne, wasabi, menthol, and wintergreen. Some act as sensors of osmotic pressure, volume, stretch, and vibration. What these substances and sensations all share in common is that they all trigger the release of Substance P, and it is Substance P that mediates the ability of the pain signal to move along the nerve, into the spinal column, and ultimately into the brain, where the sensation is actually interpreted as hot, cold, pain, etc. In other words, a nerve somewhere in the body triggers the initial impulse, but it is ultimately the brain that interprets what that trigger means. In any case, of the 28 TRP channels, the one that is of most interest in our discussion of pain is TRPV1. In addition to being a thermal detector that identifies changes in external temperature, TRPV1 is also a critical part of the system designed to signal potential and/or ongoing pathophysiological conditions--i.e., pain--that if left uncorrected, could lead to irreversible cellular injury. Now it gets interesting since stimulation of TRPV1 receptors can go in two different directions. The first direction is that following repetitive noxious stimuli or tissue injury, TRPV1 receptors can actually become more sensitive, leading to an increase in spontaneous activity, a lowered threshold for activation, and an increase in action potential firing after stimulation. We call this long-term, chronic pain. The reason for this is that heightened sensitivity and response may serve more to signal ongoing tissue injury and inflammation rather than acute noxious stimuli or short-term acute injury. This suggests a sensory system that can distinguish between an acute noxious stimulus and a chronic painful condition such as inflammation. It is this mechanism that, if out of control, can lead to the snowball effect we mentioned earlier--where pain is being continually triggered by the ongoing stimulation rather than the initial stimulus. In other words, pain causes pain which causes more pain and on and on. The second direction is that given enough stimulus to the TRPV1 receptors and the concomitant release of Substance P, it is possible to deplete the cells of Substance P to the point that cells can no longer transmit the pain signal across the cell--or from one cell to the next. But since TRPV1 responds to more stimuli than just pain--the bio-chemicals in herbs and spices, for example--it is possible to use that quality to overstimulate the receptors to the point that all Substance P is depleted and the cells can no longer transmit pain. Which leads us to an even more remarkable action of some natural substances--their effect on the spinal cord. When applied to the skin, they can cause the depletion of Substance P at the spinal cord ending of the C fiber that starts at the skin. This can result in interference of transmission of the painful impulse at the spinal cord. Slow down transmission of pain along the spinal cord. When it comes to topical pain relief formulas, cayenne, menthol, and wintergreen are the big three. Virtually every formula that you buy will be based on one, two, or all three of those ingredients. But as we will explore, an optimum formula can't end there. Capsaicin is a member of the vanilloid family, just like natural vanilla. It binds to the vanilloid nerve receptor subtype 1, also known as TRPV1, which is located in your skin.2 TRPV1 can also be stimulated with heat, cold, and physical abrasion. The resulting activation of the neuron stimulates it to signal the brain. By binding to the TRPV1 receptor, the capsaicin molecule produces similar sensations to those of excessive heat, but without the actual physical damage caused by heat. Again, the whole process uses up Substance P, which is the neuropeptide required for the transmission of the pain signal along the nerve, through the spinal column, and up to the brain--again, where pain is actually registered. And again, as studies have shown, when Substance P is reduced in an area on the body, pain is reduced, too. Incidentally, only the initial signal goes through the TRPV1 receptor. The presence of Substance P is picked up in each adjacent cell by the NK1 receptor, which triggers the release of Substance P in that cell and so on up the line. There's another way to look at this, though, that may be easier to understand. In effect, what happens is that capsaicin fools your brain into sensing heat when there isn't any. It binds to the TRPV1 receptor, causing the receptor to change shape. The change in shape literally opens the nerve cell up to take in charged particles called cations. These positively charged ions rush into the nerve, producing a signal to an adjacent nerve cell--then to the next adjacent nerve cell, and the next, then into the spinal column, and on up into the brain where the sensation of heat is stimulated. And at each step of the way, Substance P is required to move the signal from nerve cell to nerve cell. With each stimulation, a little more Substance P is used up. In real life, the stimulations are slow enough, or have enough breaks in them, so that Substance P has time to replenish in each cell--thus allowing the cells to continue to transmit pain hour after hour, day after day. But the stimulation from cayenne is so intense that it can overwhelm the ability of the cell to replenish its Substance P, which means that at that point, pain can no longer be transmitted. And that's how topical cayenne can stop the transmission of pain. But there's a twist to our story. There are actually two types of pain signal. Bad pain, or long-term chronic pain is a different animal. This is the pain that requires Substance P for its transmission. And this is the pain with which cayenne can help. The twist, then, as to whether or not cayenne can help relieve your pain, is what type of pain you are suffering from--acute or chronic. Menthol is a crystalline compound with a cool minty taste and odor. And note, we are talking about natural menthol that is found in peppermint and other natural oils, not synthetic menthol, which is much, much cheaper and that is used in many pain relief products. This is an important differentiation to look for when purchasing a product. If it doesn't say natural menthol on the label, then there's a good chance that it's synthetic. Since natural menthol costs so much more, companies that use it want you to know it. So, menthol is cooling and has a minty taste, but how does it affect pain? And the answer is that it is a bit like capsaicin's Corsican Brother.3 It is identical to capsaicin in many respects, but, as we will soon see, with a couple of dramatic differences. As we've already discussed, capsaicin works by triggering the TRPV1 "heat" receptor in skin nerves to continuously release Substance P until it completely depletes them of Substance P so that they are no longer capable of transmitting the long-term pain impulse. Well, menthol works by stimulating several receptor sites, but, most importantly, the TRPM8 "cold" kappa opioid receptor sites in skin nerve cells, which also causes them to continuously release Substance P until the cells are completed depleted and no longer capable of transmitting the long-term pain impulse.4 This explains both how menthol stops pain and why it feels cool and not hot. But more importantly, it explains why the combination of capsaicin and menthol works so much faster and better than either one alone. By forcing the release of Substance P through two entirely different receptor sites, their use in combination literally doubles the rate at which Substance P is used up and, therefore, doubles the speed at which you achieve pain relief. In addition, menthol triggers a process called vasodilation. Blood vessels widen, which increases blood flow to the area, thus reducing the skin barrier function. As a result, other medicinal ingredients found in the formula along with the menthol get to work faster while the increased blood flow itself bring nutrients necessary for cellular repair and removing cellular waste. In addition, by triggering the cooling receptors in your skin, menthol causes your brain to interpret that sensation as "cooling." As with capsaicin, your skin doesn't actually change temperature, but that doesn't matter to your body. Once the brain interprets it as cooling, it uses that effect to relieve the sensation of heat associated with inflammation. And once you remove the sensation of heat, you begin to reduce the inflammation itself. That's why many first aid products use menthol for cooling in place of ice. And it seems that menthol may also mediate pain through an entirely different, second pathway. Some studies show that menthol acts to increase the activity of the GABAA receptor protein in the nervous system.5 GABA is a major inhibitory neurotransmitter in the nervous system. This action doesn't so much get rid of pain as make your nervous system incapable of "remembering" pain. Think topical propofol/Diprivan but without the side effects. A 2009 report published in the Journal of Dietary Supplements discusses evidence from in vitro and in vivo studies supporting a possible use of St. John's wort as an anti-inflammatory remedy, in addition to its well-known antidepressant effects.7 Meanwhile, a 2006 study, published in the Journal of Ethnopharacology, found that an alcohol extract of St. John's wort successfully relieved pain in test animals, suggesting that it may have central analgesic properties.8 In addition, topical treatment with the alcohol extract of St. John's Wort significantly reduced ear inflammation. In conclusion, the study reported analgesic and topical anti-inflammatory activities for St. John's wort. In addition, when dealing with pain, you ultimately want to heal the wound that's causing the pain while trying to control the initial pain itself. That's what actually produces true long-term pain relief. Well, it turns out St. John's wort can help with that. A 2010 study published in the Journal of Alternative and Complementary Medicine found that the topical application of St. John's wort is not only safe but can indeed facilitate Cesarean wound healing and minimize formation of scar tissue and its associated pain and itching.9 However, a more notable study was published in 2015 in the journal, Evidence-Based Complementary and Alternative Medicine. This study found that diabetic wounds in test animals treated with St. John's wort showed a faster wound closure rate in comparison to the various control groups.10 In addition, the numerical density of fibroblasts, the volume density of collagen bundles, and the mean diameter and volume densities of the blood vessels in H. perforatum group were significantly higher than in the control groups. In other words, the results of this study showed that St. John's wort has the ability to improve tissue regeneration by enhancing fibroblast proliferation, collagen bundle synthesis, and revascularization. Arnica has been used for centuries as a valuable topical treatment for bruises and sprains as it improves the local blood supply, reduces inflammation, and speeds healing. And modern studies now support that use. A study, literally published just days ago in Plastic and Reconstructive Surgery found that the use of topical arnica resulted in the "rapid regression of edema and ecchymosis"--i.e., inflammation and bruising.11 This reinforces the results of an earlier study, also published in Plastic and Reconstructive Surgery, which found that arnica is effective at reducing inflammation during post-operative recovery.12 Now, to be sure, that study, unlike the recent study, did not find that arnica provides any benefit with regard to the extent and intensity of bruising. However, unlike the recent study, the arnica was not applied topically directly on the injury, but orally, which means that its effect would be less concentrated at the site of the injury. In any case, a study published just last month in Opthalmic Plastic and Reconstructive Surgery found that the combination of topical Arnica montana and Rhododendron tomentosum is effective in reducing postoperative bruising and swelling after oculofacial surgery.13 The bottom line is that topical arnica helps reduce inflammation and bruising, which means it speeds recovery and helps reduce pain. Calendula can help reduce inflammation, heal the skin, and relive pain--in addition to working as an antispasmodic (i.e. muscle spasms). A 2009 study published in the Indian Journal of Experimental Biology found that the flower extract of Calendula officinalis possesses "significant anti-inflammatory activity," capable of producing a "potent anti-inflammatory response. "14 It found that this effectiveness may be the result of Calendula's ability to mediate "the inhibition of pro-inflammatory cytokines and COX-2 and subsequent prostaglandin synthesis." Meanwhile, a 2004 study published in the Journal of Clinical Oncology found that topical calendula "significantly" lowered the occurrence of acute dermatitis resulting from postoperative radiation therapy for breast cancer.15 Specifically, patients receiving topical calendula had less frequent interruption of radiotherapy and significantly reduced radiation-induced pain. These results were echoed in a 2013 study published in the journal Oral Surgery, Oral Medicine, Oral Pathology, Oral Radiology that found that Calendula officinalis extract accelerated the healing of oral mucositis in hamsters.16 Oral mucositis is a common complication of chemotherapy. And finally, spasms are an important component of muscle pain, and calendula has been used for centuries as an antispasmodic--both externally and internally. A 2006 study published in Phytotherapy Research concluded that Calendula flower extract antispasmodic constituents exhibit these effects through calcium channel blocking and cholinergic activities.17 Although this particular study was focused on its internal use for controlling abdominal cramps and constipation, the same pathways apply when used topically to control muscle spasms. Now, that you have a sense of how MSM works, let's talk briefly about its effect on pain. A 2014 study published in the International Journal of Orthopedics focused on that exact question by examining the efficacy of MSM in treating patients with knee and hip osteoarthritis (OA).22 Outcomes were measured using the WOMAC scale, patient and physician assessments, and the SF-36 (overall health-related quality of life) evaluation. Compared to placebo, the MSM group presented significant decreases in all subscales of WOMAC with improved performance of daily living activities on the SF-36 evaluation. Even the Patient and Physician assessments exhibited favorable effects in the MSM group. The study's conclusion was that when it comes to pain, MSM improves all physical symptoms in the WOMAC scale during a short intervention without any adverse events. And now we reach an interesting point in our discussion. As we have seen, some of the ingredients that we have already discussed work as solvents and permeability enhancers that can penetrate the skin and reach deep into underlying tissue and help deliver other active ingredients into the very source of the injury, pain, and inflammation. We're now going to explore this effect in more detail and talk about those natural substances that are most potent in this regard. But first I need to explain that although transportation of substances through the skin happens all the time and everyone knows about it, the FDA frowns on it. As far as the FDA is concerned, topical pain relief products that work locally are treated as supplements…as long as the ingredients are on the Generally Recognized As Safe (GRAS) list. These include creams, gels, ointments, pastes, suspensions, lotions, foams, sprays, aerosols, and solutions, etc. that work on or near the surface of the skin. Specifically, they either exert their actions on the stratum corneum or modulate the function of the epidermis and/or the dermis. On the other hand, the FDA considers anything that passes through the skin and works directly on any deeper tissue as more drug-like and frowns on it unless it is registered as a drug. But as we have already seen, there are a number of natural substances that function as solvents and transdermal carriers that can penetrate the skin and that can carry other substances with them as they cross the skin barrier. The problem for the FDA is that there are so many natural substances that function as transporters, and some of them are in such common use, that it's impossible for the FDA to ban them all, or the products that use them. Heck! As we will soon see, even olive oil functions as a transdermal--and one of the most powerful, in fact. So how do you ban the use of olive oil in topical formulas? In the end, it all comes down to a "wink, wink, nudge, nudge" understanding with the FDA. You can use transporters, but you can't talk about them or promote them in your formulas. That means I can talk about them here, and I can even use them in formulas that I design, but I can't actually describe exactly what they do when talking about those specific formulas as retail products. Instead, manufactures use euphemisms when describing how their products work like "deep penetrating" and "fast absorbing." Nevertheless, that hasn't turned out to be much of a problem for me as versions of the pain formula we're talking about today have sold over 100,000 bottles a year, year after year, simply through word of mouth--without ever having to go into the details of the transporter system. So what are the superstar natural transporters we're talking about? Now while it is true that there are many substances that work as transporters, not surprisingly, some work better than others. And even more importantly, when certain transporters are used in combination--and in the right ratios--their effect is far more than the sum of their parts. Incidentally, this is why, even though a number of companies have tried to knock off my pain formula over the years, they have had little success. Making a successful formula requires far more than just throwing a bunch of ingredients together. With that understood, let's talk about the combination of natural transporters that I've used in topical formulas to obtain maximum penetration and effectiveness. And for those looking to copy the formulas, you'll have to figure out the ratios and the tricks for combining them on your own. Wintergreen Oil is probably the most recognized scent in pain relief balms. It not only helps carry the other herbs through the skin, it is also effective in relieving arthritis pain, joint stiffness, muscle spasms, and inflammation. Emu oil is a natural emollient that has been used by Aboriginal Australians for thousands of years for its remarkable healing and anti-inflammatory properties. I'm not big on using animal products in my formulas but will make an exception when the pros outweigh the cons. Over the years, as I mentioned earlier, I've made versions of this formula both with and without emu oil, and the bottom line is that no matter how you look at it, the formula works noticeably better when it includes a small amount of emu oil in it. The good thing is that it takes very little emu oil to significantly enhance the efficiency of this formula. The oil that comes from just one emu is enough to make 30,000 bottles of the formula. And when you consider that a single 1 OZ bottle is good for 200-300 applications, that means that one emu is providing between six to nine million doses. To be able to relieve pain and suffering six to nine million times in human beings at the cost of one emu is a tradeoff I'm willing to make--especially when you consider that the emu in question was already being killed for its meat and hide anyway. In other words, no emu was sacrificed just to make the formula. Now let's look at why emu oil makes such a difference in the formula. According to a 2015 review published in the January edition of Nutrition, emu oil contains high amounts of polyunsaturated fatty acids and antioxidants that appear to act on cyclooxygenase, lipoxygenase, and lipoxin pathways to bring about its potent anti-inflammatory benefits.27 More specifically, a 2005 Chinese study found that topical emu oil has anti-inflammatory activity in rats with superficial scalding.28 The study noted that this anti-inflammatory activity was probably connected to emu's ability to decrease levels of pro-inflammatory cytokines in the damaged tissue--which would also explain emu's ability to promote wound healing by inhibiting local secondary inflammation. D-limonene is a compound extracted from the peels of citrus fruits. Although, it takes its name from the lemon, as the rind of the lemon like other citrus fruits contains considerable amounts of this compound, it actually has a very strong orange smell. I use it in most of my tincture formulas because it is one of nature's great solvents and helps carry the other ingredients quickly into the body--and then into the cells themselves. (Also, as a great solvent, it helps in the extraction of the bio-chemicals for the herbs when making tinctures.) I use it in my topical pain relief formula because it works as a transdermal and enhances skin penetration. But I also use it because it has powerful analgesic and anti-inflammatory capabilities in its own right, as well as being a superb antispasmodic. A 2015 study published in the Journal of Natural Medicine focused on the analgesic and anti-inflammatory properties of an essential oil made from Citrus aurantium L. blossoms, known in the trade as neroli.30 Neroli oil has a high concentration of limonene. Without going into the details of the study since it involved monitoring the induced writhing of rats, the neroli oil demonstrated significant activity against acute and especially chronic inflammation, and significantly reduced the activity of pain receptors, thus supporting its use in the management of pain and inflammation. Meanwhile, a 2015 study published in Research in Pharmaceutical Sciences examined the antispasmodic activity of the essential oil of D. kotschyi.31 (Note: Dracocephalum kotschyi is an essential oil containing plant found in Iran, traditionally used as an antispasmodic and analgesic. Like Citrus aurantium, its primary active ingredient is limonene.) The study found that the antispasmodic effect of the D. kotschyi oil was primarily due to the presence of limonene. But again, the main role of limonene in this formula is for its transdermal delivery properties. It's important to remember that the use of natural substances as transporters is not limited to the world of alternative health. In fact, a number of studies have specifically looked at their use for transdermal drug delivery. A 2008 review of a number of these studies, for example, looked at the potential mechanisms of action of natural penetration enhancers.32 The reason for the interest in natural transporters is because synthetic chemicals (solvents, azones, pyrrolidones, surfactants etc.) generally used for this purpose had lost much of their value in transdermal patches due to reports of their absorption into the systemic circulation and subsequent possible toxic effect upon long term application. Terpenes, such as those found in limonene, on the other hand, are included in the list of GRAS substances and have low irritancy potential. Their mechanism for carrying drugs through the skin involves increasing the solubility of drugs in skin lipids, disruption of lipid/protein organization and/or extraction of skin micro constituents that are responsible for maintaining the skin barrier. As the review concluded, the terpenes as found in limonene appear to offer great promise for use in transdermal formulations. DMSO is MSM's big brother, and like MSM, it enhances antioxidant function and reduces pain and inflammation at the site of injury. But more importantly, it works as a universal solvent and the ultimate transporter. DMSO has been described as having significant anti-inflammatory activity. This has generally been attributed to the effectiveness of DMSO as a hydroxyl radical scavenger. However, DMSO can also act as a reductant under certain conditions, yielding its fully oxidized form, dimethyl sulfone (DMSO2), as the product. A 1987 study published in the Journal of Laboratory and Clinical Medicine evaluated the ability of DMSO and DMSO2 to interfere with the production of oxidants other than the hydroxyl radical.36 In fact, the study found that both DMSO and DMSO2 significantly suppressed the production of superoxide, hydrogen peroxide, and hypochlorous acid radicals. Inhibition of the oxidative function of stimulated neutrophils by DMSO may provide an alternative explanation for the effects of this compound on the microbicidal activity of neutrophils and why it works in the real world as an anti-inflammatory agent. As I've mentioned. DMSO is a universal solvent, but what I haven't mentioned yet is that DMSO is widely used in neuroscience research as a solvent for various pharmacological agents in both cell culture and in vivo studies and is also used in humans to treat musculoskeletal problems and pain. Beyond that, however, a 2001 study published in Experimental Neurology reported that concentrations of DMSO to which neurons are typically exposed in experimental studies and in human patients inhibit glutamate responses in hippocampal neurons. In fact, the study identified a mechanism that might explain the beneficial clinical effects of DMSO on both peripheral and CNS neurons and suggests a potential use for DMSO in the treatment of excitotoxic neurodegenerative conditions. But its action on glutamate also means that DMSO can address acute pain, which no other ingredient in this formula can actually address. If your formula doesn't contain DMSO, it's not addressing acute pain. That said, the real reason we use DMSO in this formula is for its solvent/transporter potential. The unique capability of DMSO to penetrate living tissues without causing damage is most probably related to its relatively polar nature, its capacity to accept hydrogen bonds, and its relatively small and compact structure. This combination of properties results in the ability of DMSO to associate with water, proteins, carbohydrates, nucleic acid, ionic substances, and other constituents of living systems. Of foremost importance to our understanding of the possible functions of DMSO in biological systems is its ability to replace some of the water molecules associated with the cellular constituents, or to affect the structure of the omnipresent water.37 The bottom line is that DMSO is a remarkable solvent and the most powerful of the transporters. The use of DMSO in combination with the other transporters is what makes this formula transcendent. Much misinformation was spread about DMSO several years ago in an attempt to discredit it -- and even though later disproved, that misinformation has continued to spread -- sort of like an "urban legend." The same kind of misinformation campaign has been spread against herbs like Chaparral (also several years ago) and St John's Wort and Kava Kava. Note: DMSO comes in different grades/purities--often given names/designations invented by the manufacturers and having no real meaning. The bottom line is that you want to avoid any of the low purity industrial grades and make sure to use a 99.9% grade that meets the specifications of the American Chemical Society (ACS) as suitable for pharmaceutical purposes. In this formula, olive oil is used both as the carrier base for the essential oils (St. John's wort, arnica, and calendula) and for its own anti-inflammatory40 and transdermal properties. But beyond that, olive oil has some of the highest transdermal properties in nature. Let's look at some of the supporting studies. The last study I want to look at is a 2015 study published in International Journal of Pharmaceutical Investigation that evaluated the efficiency of various penetration enhancers for improved permeation of the NSAID drug ketorolac tromethamine through the skin.43 Now you need to take this study with a grain of salt for several reasons. First, it was conducted on rats, not people, and rat studies don't always translate to humans. Two, it didn't even run the test on live rats, but on dead skin patches taken from rats. And three, it tested only one drug; different drugs may perform differently. That said, it was interesting in several ways. First, among the top performing penetration enhancers were: oleic acid (olive oil is the primary oleic acid oil), limonene (although they used l-Limonene, the synthetic version, which is less effective than d-Limonene44), menthol, and DMSO. As you can see, the formula we've been discussing is packed with transdermal enhancers. The trick in designing a topical transporter system is to not rely on redundancy since it provides little advantage. But most manufacturers, if they think of it at all, merely add different ingredients that indeed do the same thing, such as adding multiple oils. But using both olive oil and sunflower oil in the same formula, for example, doesn't gain you very much. They both rely on oleic acid, which achieves its skin penetration capacity through its ability to work with the lipids in the skin. You gain nothing by using both; in fact, you'd be better off simply using more olive oil since it has a higher concentration of oleic acid. Instead, what you want to design into your formula is complementarity, not redundancy. Think of it this way. If you incorporate olive oil, d-Limonene, and DMSO in your formula, you're now achieving your transdermal potential through three entirely different pathways: lipid, vasodilation, and water replacement--tripling the capacity and speed of your formula to move pain relief into underlying deep tissue--not to mention significantly increasing the depth to which it can transport. That's how you design a transport system. Because the solvent action of the transporter base in this deep tissue pain relief formula is so powerful, a little goes a long way. Normal use requires only 2-3 drops to cover a tweak in your neck, for example. 5-6 drops is enough to cover your entire lower back. Because you use so little for each application, the formula is remarkably economical. A single one-oz. bottle is good for anywhere from 100-300 applications. And a single application can provide hours of relief. Wash your hands before using the formula. Remember, this formula is designed to carry ingredients through your skin. If you have toxins on your hands and don't wash them off, it will carry those toxins through your skin along with the pain relief ingredients. Wash your hands after applying the formula--and be extra careful to avoid contact with your eyes and going to the restroom before washing your hands. If you forget, there will be no permanent damage, but you are likely to feel very uncomfortable for about 15 minutes. Think about it. Do you really want to be accidentally applying cayenne to those areas? Keep the bottle out of the reach of children. Remember, the formula contains wintergreen oil which is packed with natural salicylates. Like aspirin, salicylates are considered potentially toxic to children if they consume enough. One or two drops wouldn’t matter, but drinking a portion of the bottle would. Do not overuse or the area may get too "hot" from the cayenne. The better option is to reapply in 10 minutes for additional relief if needed. Use your fingertips to rub in. Avoid using your palms if possible. There is no harm in doing so. You may simply find that your palm warms up more than you would like for several minutes. The formula can transport though soft tissue, but not through bone. Keep that in mind if you are looking to relieve joint pain. For finger pain, it's not an issue since it's so easy for the formula to work its way into the joint, but for the bigger joints such as the shoulders and the knee, you need to apply the formula on an area of the skin that sits above the opening to the joint, not over the bone. For example, for knee pain, you can try applying from the side of the knee rather than right over the patella. If you want to see how this formula is so dramatically different than any other topical pain formula you have ever used, rub a couple of drops into your bicep. You will feel the oil penetrate through your skin and work its way through the muscle and down to the bone in about 30 seconds. Compare this to the heating action of most topicals that merely sit close to the surface and radiate their heat downward. Although virtually all topicals have some transdermal capability, it is paltry compared to the transdermal power of this formula. There is a reason that we have sold an average of more than 100,000 bottles a year of this formula for over a decade--on word of mouth alone. I did not see any place to order or how to get this wonderful Pain Formula? Could you please send me this information? The Foundation does not sell products, but if you see the "Products" link above, you can see all the products Jon Barron recommends, including this one, and what company sells them. For this formula, look at the bottom of the list for "Muscle & Joint Oil." Hope that helps! I have just discovered your site and find it to be very informative. In reviewing your article on Supplements, I find that I am already taking 90% of them but I am using many of them separately. I see that the "Products" is no longer active, yet I would like to reduce the number of individual products by combining some your recommended supplements into a few pills as possible. Since your site apparently no longer makes product recommendations, have you any other suggestions as to how I may accomplish my goal of reducing the number of individual supplements and also perhaps reducing some of my expenses. Thanks for finding us! The link should be working again, I would start there. Jon has said that if you take all his recommended supplements individually, which you can, it does get very expensive. That is why BaselineNutritionals.com started creating his formulas so they could buy in bulk and offer the combinations as one supplement. You should check out their site. I have Firomyalgia and would like to know what would work best for me. and do I rub it all over my body that is in pain. Is it safe to use w Lymphedema? Or after surgery? Apparently some things have changed lately...the product evidently is now called "Essential Relief"...I do plan on buying it pretty soon...the explanations for ingredients is very enlightening...! I can not find a link under PRODUCTS to this product. It's not listed as "Muscle & Joint Oil" as you instructed. Sorry, that page was recently updated. 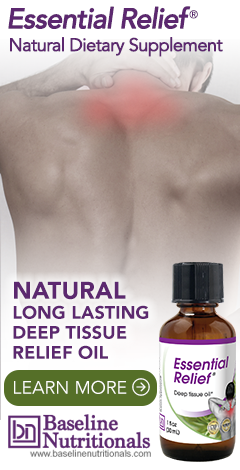 It is now called "Deep Tissue Relief Oil." Also known as "Essential Relief." My husband is a c5-6 quadriplegic with severe neurological pain. Will this work for his pain as well? For obvious legal reasons, we cannot diagnose or prescribe for specific medical conditions—merely provide information. But, please do let us know how it works for you if you give it a try: https://www.baselinenutritionals.com/products/essential-relief.php Check out the video on this page for more information. My mother use for decades a mixture of glorox <5% and MSM against all kind of pains. In the Netherlands MSM is called "Geest van hout (Spirit of wood)"
Till 1974 it was sold as pain reliever in every drugstore but now its only for veterinarian use allowed. I have remarkable pain relief stories in my pain relief shop with only glorox and MSM. Metastatic prostate cells that got in between my 4&5 vertebrae . Essential Relief Works!!! I have really bad arthritis in my pinky finger. I just apply this oil and the aches just disappears. It did the same for my hip joint. Thank you! I love this stuff! I do have a question about the phizymes. My husband takes them faithfully, but I have noticed that when I take them, I get an acid reflux, feeling and just have a hard time with them the first hour after I take them. Why is this? Thanks for the great testimonial! I sent your comment to the support staff at Baseline Nutritionals since they handle product related questions. Thanks.